I knew that this experiment was going to be a challenge. Everyone I spoke to about it told me either: a) I’m crazy, b) $20 is just too little money to recreate a look, or c) that I must have a lot of time on my hands. Well in response to those comments, yes I probably am a little crazy, $20 is a VERY tight budget to stick to, and well, as for time, with the exception of doing some volunteering I was at home this week having a little staycation so I had the luxury of some extra shopping time. We’ll see how next week pans out when I’m back doing school-work full time (if you’re looking for me I will either be: a) at school, b) strapped to my computer at home, c) swimming in the bottom of a bargain bin, or d) at the gym doing cardio to build up my endurance for shopping marathons). Without a doubt this challenge was very difficult. I visited more stores than I can count and every type of store imaginable. I have to admit to lying in bed a few nights wondering if I bit off more than I could chew. I think that I may have been a little overambitious with my first fashion choice. The thing is, at first glance an article of clothing can look very simple but when you actually break it down based on its details it ends of being more complex. The Marc Jacobs cardigan is a good example of this. At first it looks like a simple cardigan but then you notice all of its elements. 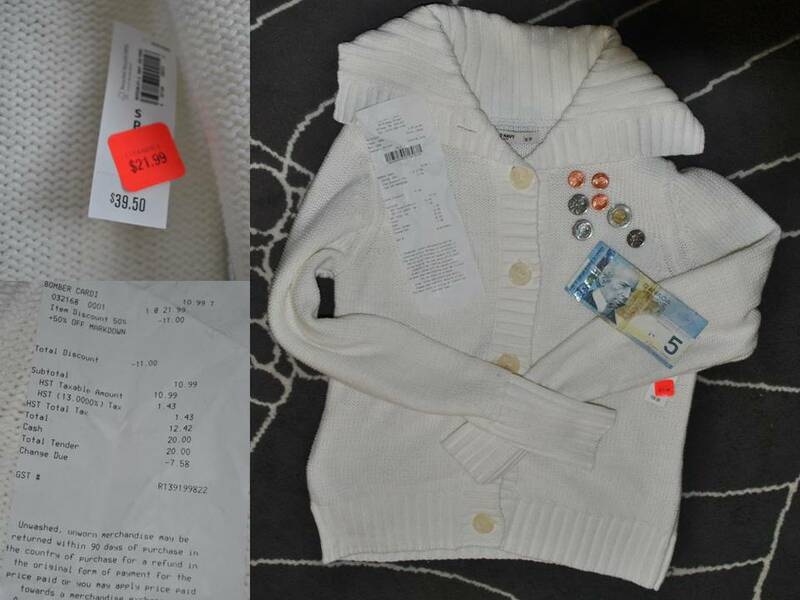 So when I was shopping I had to consider that it is a button-front cardigan, that it has a ribbed neckline, cuffs, and hem, that it has three-quarter length sleeves, that it is stripped, and that the colour tones are beige, pink, and grey. I tried as best I could to match as many of these elements as possible but of course I couldn’t find an exact replica (although if you have $54.99 there is a similar one at Banana Republic, unfortunately I don’t have a picture of it). So onto the big question: how did I do? Well, I tried my best and I did end up finding something! I’m not sure how much it lives up to the essence of the Marc Jacobs cardigan (not perfect but as close a match as I could find within my budget) but I guess that’s for you to decide! It is made up of a luxurious blend of 60% cotton and 40% acrylic. 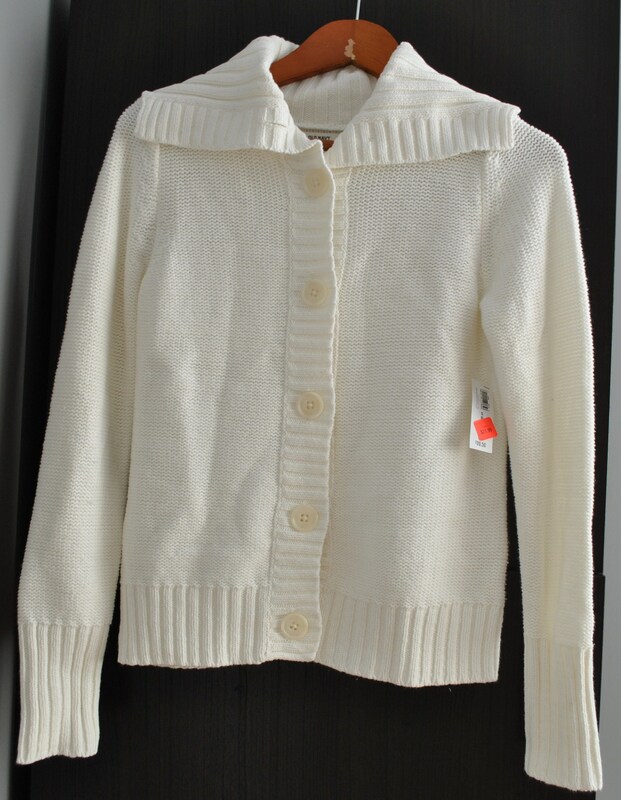 Ladies and gentlemen, “a rich blend of silk and cashmere” this is not, but it is still a cute basic cardigan that I can add into my wardrobe rotation (I’ll let you know how it holds up quality-wise once I wear it). So what was the grand total for this garment? 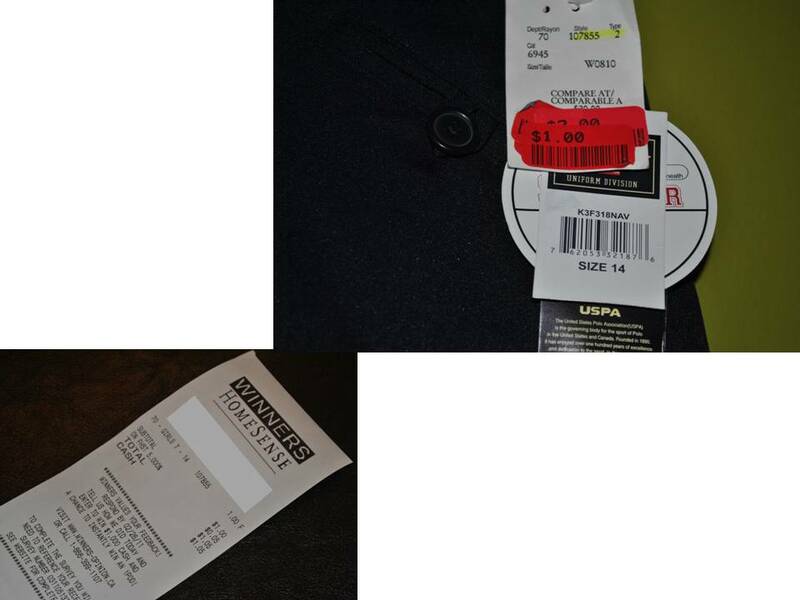 Well, it was on sale in the clearance section of Old Navy for $21.99 and everything in the clearance section was an additional 50% off so with taxes it came to a grand budget-friendly total of…$12.42! That left me with $7.58. The skirt came to a grand, unbelievable total of $1.05 and I got it in the children’s section of Winners. I couldn’t believe it! Even the girl at the cash said that it was one of the best deals she has ever seen at the store! So when I subtract everything from my $20 I’m left with $6.53 for future ventures (I’ll post about what I’m going to do with left over money sometime next week). I will also wear this to school and conduct my own very scientific poll of my co-workers and let you know the overall verdict next week (I’ll probably end up calling it something cheesy like the “Tuesday testimonial”). Thanks Erin! 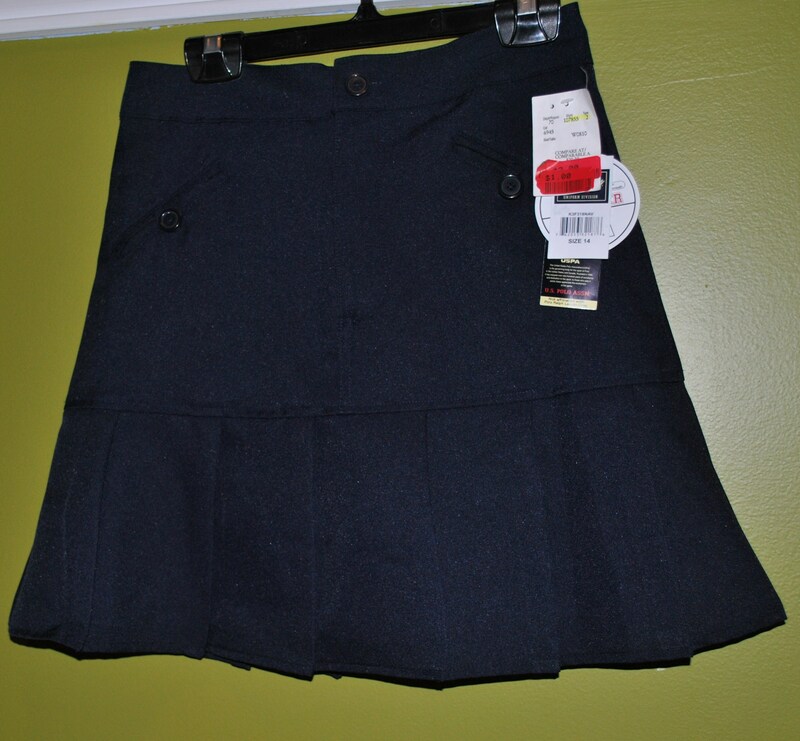 I still can’t believe I found the skirt for $1, sometimes it pays to shop in the kid’s section! I know, the sweater is a little big but the only XS I found had a stain on it. I can’t believe you got all that and are still UNDER budget! You succeeded with style, and Mike and I think you look great! Check out My Fashion Lust List’s latest giveaway and enter to win a Swapflower necklace by Judit Wild!